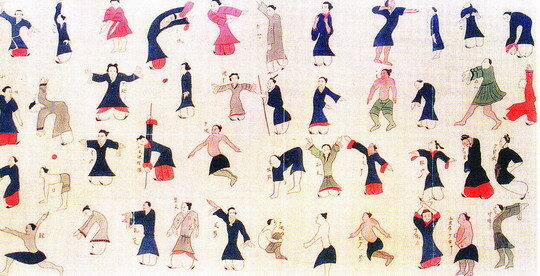 Qigong (chee-gong) is a relatively modern name for what was formerly known as daoyin, tuina, neiquan and jingzuo that is back dated to nearly 5,000 years. Qi means energy, the energy of the universe. Gong means to gather with skill, thus qigong is to gather energy from the universe with practiced skill. There are over 3,000 forms of qigong; tai chi, more commonly known is but one form. Like tai chi, qigong appears to be a gentle slow rhythmic movement, usually done while standing. The practitioner is using mental imagery, breath and movement to gather qi, and bring it into the body. The results calm the mind, energize the body and help to create a sense of balance both literal and figurative. Today millions of people in China and around the world regularly practice qigong as a health maintenance exercise. Qigong and related disciplines are still associated with the martial arts and meditation routines trained by Taoist and Buddhist monks, professional martial artists. Formerly much more closely guarded, in the modern era such practices have become widely available to the general public both in China and around the world. The wonderful effects of qigong have yet to be fully explained even in the light of modern science. Initial studies have amply shown how with correct ways of breathing, qigong helps to regulate the equilibrium in the higher nervous system and other systems of the human body. It also helps promote the normal functions of different organs and build up inner strength – all conducive to stronger resistance to diseases and to better heath. So far as the nervous system is concerned, qigong helps to regulate the equilibrium between excitation and inhibition on the ANS (autonomic nervous system). For those who suffer from neurasthenia, which is a condition with symptoms of fatigue, anxiety, headache, impotence, neuralgia and depressed mood, practicing qigong will make them feel relaxed and gradually improve their sleep. With respect to the respiratory system, qigong can improve the function of the lungs and increase Qi, vital energy. While the average person normally breathes 17 or 18 times per minute, one who persists in qigong practice can breathe two or three times a minute during exercise without feeling out of breath. Circulation and blood pressure can be improved. Qigong helps blood circulation. Different kinds of qigong methods can be used to adjust blood pressure. Supplemented by other therapeutic methods, they can help heart disorders such as hypertension and arteriosclerosis. Qigong exercises also produce obvious effects on the digestive system. Among other things they promote digestion by stimulating the gastrointestinal movements and the secretion of digestive juice. That’s why those who regularly practice qigong usually have a good appetite and seldom suffer from indigestion and constipation. Qigong speed up slow sluggish metabolism in the human body, activates secretion in various glands, and helps to keep one’s body weight at a normal level. It also helps emotional balance and concentration. There are many kinds of qigong exercises. They may be classified according to body postures, such as lying, sitting, and standing and also with motion and motionlessness. One who has a weak constitution should start with the lying posture and gradually progress to exercises in the sitting and standing positions as he grows stronger. If you have a good qigong teacher, he’ll be able to examine you and decide what forms of qigong is the best for you. Never try the three postures all at the same time. Breathe naturally, softly and rhythmically, and do not draw out your breath with force. No matter which posture you may practice, position yourself in a way that you can feel your whole body fully relaxed. Try to integrate movement (dong) and stillness (jing) in your exercise program. Generally speaking, Taijiquan is a kind of moving exercise in qigong. So besides doing static qigong exercises, it will do you good to practice a little Taijiquan or some other active forms of fitness exercises. Be patient and persevere when you practice qigong and do not seek immediate results. Although qigong can be used to keep fit and cure disease, it is no panacea. Good results can be achieved only when we combine it with other methods of physical training and medical treatment in a way that best suits the conditions of each individual. On June 21, 1980 at Shanghai No. 8 People’s Hospital, a unique surgical operation took place which made world news. A qigong master, Lin Hou Sheng from the Chinese Medicine Research Institute stretched out his right hand and pointed his index and middle fingers at Yin Tang (an acupuncture point) between the eyebrows of the patient. Through his fingertips he emitted wai qi (externally projected qi) from a distance of about 3 centimeters on a 29 year old female patient. After three minutes, he nodded to the surgeon who then picked up his sharp scalpel and commenced a surgical operation on a thyroid tumor. The patient received no additional anesthesia, remained conscious throughout, and did not show even the least sign of pain during the 140 minute operation. When a walnut sized tumor was removed and shown to the patient, a smile lit up her face. Lin Hou Sheng using emitted Qi for anesthesia during surgery. This was the tenth thyroidectomy in little over a month performed with qigong anesthesia at the hospital. Lin, age 41 at the time, has used emitted qi to treat successfully such varied conditions as stomach ulcers, hypertension, urinary incontinence, and protrusions of lumbar vertebra. Since the mid 1980’s, due in part to the attention generated by Lin, renewed interest in Qigong and Qigong healing developed into a national fad in China. More recently, Dr. Wan Sujian, a Chinese army doctor and Director of the Institute of Chinese Daoist Medical Qigong in Beijing, has gained worldwide renown for his success in treating thousands of paraplegic and quadriplegic patients with External Qi Healing. Dr. Wan’s army hospital has also searched throughout China for children who exhibit special Qigong healing abilities and has brought them to the hospital for further training as Qigong therapists. External Qi Healing (Wai Qi Zhi Liao) is not usually a primary health care choice for most people. It is mainly resorted to when other conventional treatment methods have failed. The fact that External Qi Healing is successful when nothing else works points to its special value and importance as a limb of Oriental medical practice. The Shanghai Atomic Nucleus Research Institute of the Chinese Academy of Sciences has identified Lin Hou Sheng’s “Wai Qi” as a low-frequency modulated infrared radiation. Other Qigong research in China on emitted Wai Qi from other Qigong healers has measured not only infrared radiation being emitted from their hands :China Healthways Newsletter, IssueNumber 72 (San Clemente: China Healthways Institute,1997), but also low levels of electric energy, electro-magnetic, magnetic, and low frequency modulated infra-sonic sound (8-14 hertz26). Robert O. Becker, M.D., a Syracuse, NY specialist in orthopedics and one of the world’s leading research authorities on bio-electricity, has verified that the body responds best not to high currents of electrical stimulus, but to extremely low levels; so low are the beneficial electrical levels (measured in millivolts and nanoamps) that it is only over the past 30 years that scientists have developed equipment sensitive enough to accurately measure these levels. Dr. Becker’s research has led to the use in Western hospitals of low level electrical stimulation to treat complicated fractures which are otherwise difficult to heal. Dr. Becker also received one of the first NIH research grants to study acupuncture in the early 1970’s. His research determined that the acupuncture meridians are electrical conductors, with the surrounding skin displaying greater conductivity and lesser resistance than the skin in non-meridian locations. He also determined that the acupuncture points act as DC power generators, keeping the electrical flow from diminishing over distance like step-up booster amplifiers. External Qi Healing can be effectively combined with acupuncture therapy in the clinical setting. Instead of stimulating the needles through manual manipulation or electro-stimulation, Dr. Kim projects qi directly into the inserted needles using either tonifying or sedating techniques for specific conditions to maximize the effect of acupuncture. Dr.Kim at times points his palm or fingers directly at the needles as needed, without physical contact and also sits in the room with the patient and generate a healing field which stimulates the inserted needles, causing them to vibrate in some cases.